We’ve been very busy since our last progress update, the holidays have only recently finished and all the big industries have only just reopened (they’ve been closed down throughout the school holiday break) so we’ve been playing catch up, double time and have been on a very tight schedule, so we are apologetic for the delayed blog post update. We’ve also been inundated with requests to come and visit the Château, to see all our hard work up and personal, we’ve already had some lovely people stop by, we’ve had people visiting France how came out of their way to visit us we even where a surprise for a birthday. It’s has been quite overwhelming for us, we are filled with so much joy and pride and are so honored, that we have inspired so many people to love this old lady, in such a beautiful village, as much as we do, seeing people’s reactions, when they see it up and close, with their first thoughts, the feedback has been tremendously positive, making all the hard work we’ve put in, worthwhile. The interior work of the Château has been insanely hard it’s needed a lot of elbow grease, time and patience, not only on the work, but waiting to have the right approvals to start the work which all came at once. At the same time, it’s been very exciting for us because now we are finally doing what we love. It’s taken us a long time to get here especially to this exact point actually it’s taken us two-years and now we get to put back some beautiful touches to this old lady who has been forgotten for long enough. The ceilings, cornice and decorative plaster work has all started to go up for the hallway, we had to hand chip off all the old cement which took us days to-do. We then sandblasted the stone back, we spend time and resealed it all back up, we then one coated which again took a team effort. We then added the beautiful decorative plasterwork which to us blends the period style with the modern futures to give it a “twist”. But, before this all happened at the end of last year we pulled down all the old ceilings, the damaged beams from dampness that made them no longer safe or viable. We had to redo all the electrical wires and plumbing. We then added everything that we needed to for the fire doors and fire exist, with every ceiling we’ve done so far it has been double boarded with fire boards so it hasn’t been a fast process, however like everything you have set back, every time we go one step forward – we end up ten steps back. We have started working on the second floor hallway it will look exactly the same as the lower floor so everyone of our guest on either floors can admire the plaster work when walking out of the room. All seven rooms have also started; we will have more on them in our next blog update. We also took some time to clean up, sandblast and re-pointed the sandstone in the entrance way this is one of the first things you will see when walking through the green mysterious doors. Where we have the reception area we have planned for a beautiful seating area which will be next to the main staircase. We decided to also build a reception desk from scratch making it one of a kind. We then plastered it ready for the decorative panels to match the hallway we are also tossing around the ideas for the counter top. We are hoping to-do sandstone, marble has been mentioned we’ve also had some fantastic suggestions send through Facebook and Instagram that we have thrown in our idea hat. We also worked on the chapels steps over the years it’s loosened up, so we used the sunny day and fixed them. They should be standing for many years to come now after the handwork of fixing them up was a heavy job. Our little river on the property is dry at the moment which is giving us good time to remove all the dead trees, weeds, and all the overgrowth. It’s also being dug out to its original size over years it’s decreased in size from all the dead foliage and its the perfect time before the autumn rain arrives. We’ve blocked it at the moment since it dried out so it doesn’t fill up while we dig it out properly we are putting in a valve in the channel so we can control the water flow and make sure it’s clean water from the river as it was originally. This area is beautiful to stop sit and read with the deer, bird, duck, swans and all the other wildlife who enjoy this spot on a regular basis. We’ve been moving the watering system around the grounds a lot it’s a lot like puzzle we did this especially during the warmer summer months the water that is used comes from a well that we had drilled last year and because they had to drill a good depth the water is freezing which is a good shock to the system if you ever get caught out by them which happens more often than you think. But if you have any further question or inquiry’s please e-mail us on chateau.le.mung@gmail.com or subscribe on here. 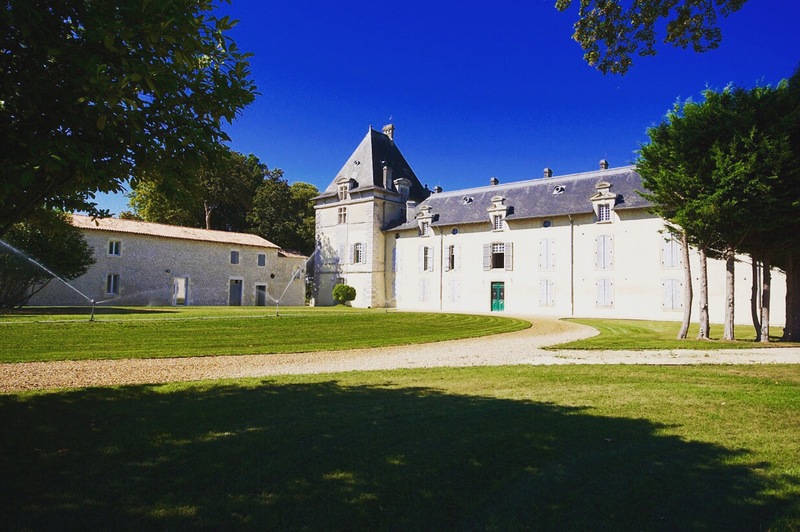 Thank you for the report – you have made amazing progress and the chateau is magnificent! The interior work is just beautiful and so true to the original. Your family is so impressive and it means so much to folks like myself to be able to share your experience with this amazing project! Looking forward to visiting someday soon. It’s all so magnificient! Your work ethic is incredible. I’m amazed by how long and hard you have all worked since this began. I hope for a nice, long rest for you all soon. Thank you for sharing this beauty. It’s simply stunning what you’ve done. Thanks from the USA. PreviousIt’s Our Two Year Project Anniversary. NextOverview of this year at the Château.